At this point these are pictures from the outside. Very soon the pictures will include views from the top of the Giralda as well as some of the inside of the Cathedral. The tomb of Columbus? With the help of the FBI and some new DNA analysis we may soon know if his remains reside in the Cathedral. Included are views from the Giralda. Located in the city center next to the Cathedral, the Alcazar is one of the most visited sites in Seville and should not be missed. Pictures of the inside and gardens just added. Thanks to Dave Barlag for providing me with some pictures from a bullfight. You can see some of the action here, as well as a few photos of the outside. Not to be missed when you're here, Barrio Santa Cruz is the old Jewish quarter or juderia located next to the Cathedral and the Alcazar. With narrow streets and plenty of plazas it's a great place to relax for a drink or a stroll in the evening. The plaza was in bad shape after many years of neglect. Thankfully several years of renovations were put in and the Plaza is looking much better, even if the quality of some of the ceramic details isn't what it used to be! Constructed for the 1929 World's Fair under the plans of architect Anibal Gonzalez, the Plaza de España is located on the edge of the Parque Maria Luisa. Seville's town hall sites between Plaza Nueva and Plaza San Francisco and is often a place to meet before heading out for the night. The side on Plaza San Francisco is the best to see the architectural details. Famous 16th century house in Seville, it is located near the Puerta Carmona. Pictures from the inside are on the way. This palace located on calle Cuna is perhaps the largest collection of roman mosaics in Seville, besides any public Museum. Venturing upstairs there is much more to the palace than just the mosaics. The backdrop is the Iglesia Salvador, currently closed for renovations. The plaza is another favorite meeting place for a beer on Saturday or Sunday afternoon. The church dates back to the 17th century and the building still serves it's purpose as a refuge for the ill and less fortunate. Works inside include two paintings from Juan de Valdés Leal as well as the intricate altarpiece work by Pedro Roldán. Across from the Cathedral and hidden through and alley you will find this plaza, where the Sunday collectable market is held. Also check out the Sunday market photos. Near the University of Seville, Hotel Alfonso XIII and the river, it's hard not to pass by the Puerta de Jerez when you visit Seville. A few of the sites with Roman history. Around the center you can get to them with little walking. I will soon add a separate Italica photo album which is the most impressive site just outside of the city. When considering the size and scope of the old city wall, not much remains in the modern Sevilla. The best place to get a glimpse is in the Macarena, just around the church. So much promise in 1992, now it's half used while the other half awaits renovations or new buildings. Still, some very interesting architecture amid some of the "ruins" from 12 years ago. You can't get to the Plaza de España without going through at least part of this park. Plenty of gardens in this photo album. I will soon have more pictures of the Plaza de America and much more. Behind the walls of the Alcazar you'll find these gardens. Most of my time spent there is on my way to the Betis games. In what used to be the kings orchards, and before that an Moorish military complex, you will find the Jardines de la Buhaira. I happened to stop by during a flamenco fashion show, so there are a few pictures from the runway as well. During the summer nights it's the place to be. Along the river you can catch a glimpse of the Torre del Oro, the Giralda and the Plaza de Toros to name just a few things. Often skipped by visitors, this is one of my favorite churches. More like a Museum as there are no longer any services held in the church, it is well worth the 15 - 20 minute walk from the center. One of the best examples of baroque architecture in the city of Seville. Located in the San Lorenzo neighborhood, the church shares the plaza with the Basilica del Gran Poder. The 14th century Gothic-Mudejar style church was altered significantly in the 18th and 19th centuries. On calle San Luis in the Macarena neighborhood, this church was burned down during the Spanish Civil War, but has since been rebuilt. The interior of course suffered a lot of damage but the exterior is still impressive. Between the calle Feria and the Alameda, this 15th century gothic church suffered significant damage after the earthquake of 1755 in Lisbon. Renovations after the earthquake included a baroque spire. Located in the city center, between the Santa Catalina neighborhood and the Plaza de la Encarnación. The 14th century church is where the famous painter Diego Velázquez was baptized. The 14th century church was originally of Mudejar architecture, but renovated in the 17th and 18th century to a baroque style. It suffered serious damage in 1936, and was very recently renovated. My father-in-law remembers the tower as the sight of a machine gun turret during the Spanish Civil War. The original church was constructed in the 13th century, although an earthquake in the 18th century and a fire during the Spanish Civil war damaged the church. It was restored in the 1970's and as one of Seville's largest churches it's worth a trip to Triana to see. In the heart of Santa Cruz on calle Mateos Gago, the church also can be seen from behind on calle Ximenez de Enciso. Built on the site of a former synagogue, the church is only a few minutes away from the Cathedral. On the corner of the Plaza de la Encarnación, this large 16th century church is in dire need of new lighting inside. This would help you see some of the amazing works inside including an altarpiece by Martínez Montañés. A very small church on calle Adriano in the Arenal neighborhood. The church is located adjacent to the Plaza de Toros and is the home of the Hermandad de "El Baratillo". The King once watched a procession from the balcony of the nearby Hotel Adriano (before it was a hotel). In the middle of the shopping district, the Iglesia San Antonio Abad is well known for the Semana Santa procession "El Silencio", which is one of my favorite's during "La Madrugá". The church was formerly a hospital and small chapel which were later joined together during renovations. In the middle of the juderia section of Seville, the 18th century church stands on the former site of a synagogue. Aside from perhaps a few stones of the foundation there is nothing left to indicate it's past. Recently restored, it is in a wonderful corner of this quarter. On the calle Albareda just a few blocks from the Plaza Nueva. The 17th church is less impressive from the outside. The inside makes it worth a visit, plus you can stop by the bakery just in front: Horno San Buenaventura, one of the oldest in Seville. In the Puerta Carmona, the 14th century San Esteban church was built on the former site of a mosque, and is just a few doors down from the Casa de Pilatos. During Semana Santa locals gather to watch the floats leave: this is the lowest door in Seville, which makes the departures from the church very difficult. The neo-classical church was finished in the beginning of the 19th century, although much of the artwork inside dates further back - from 17th and 18th centuries. The twin towers make the church architecture fairly unique to Seville. Just a block from the Plaza Alfalfa, the 14th century church is one of many Gothic-Mudejar churches which was likely built on the former site of a mosque. You can enjoy a nice meal outside in front of the church at Pizzeria Orsini! A modern church just behind the Teatro de la Maestranza in the Arenal district. Very small, and not much of a sight from the outside. It is home to the brotherhood of "Las Aguas", formed by the fusion of two brotherhoods in 1977. This is one of the smallest chapels in Seville and you can only see it from the outside. Located in the Arenal quarter, it is part of the old city gate known as "El Postigo", and known as the home of the Virgen de la Pura y Limpia del Postigo del Aceite. Attached to the Iglesia San marco is this small 18th century chapel. this area is filled with churches, convents and chapels and makes for a nice walk. Inside it is often dimly lit, but you can see images which make up part of "Los Servitas", one of the many processions during Semana Santa. The 17th century church was restored and reopened sometime in 2008. Inside it is wonderful - baroque sculpture, altars and paintings - all of which make it one of my recommended visits! Located on the calle Sol, just a block from the Plaza de los terceros, construction began on this church in the early 17th century. It is home to the brotherhood of "La Cena", the float which represents the Last Supper during Holy Week. This former convent of St Paul is one of the best examples of Sevillian baroque architecture. The construction of the church in its current state dates to the 18th century. This is another church which feels much like a cathedral when you enter. Iglesia El Salvador was closed for several years after a stone fell from the ceiling. The restoration also took longer as they found important ruins from the former church and former principal city mosque. The renovations were very well done, and the church is more impressive than it ever was. The original gothic-mudejar church dates back to the 14th century, although renovations in the 18th century added many baroque touches. The plaza in front of the church is a favorite place for locals to grab a table at Bar Santa Marta and enjoy the view with dinner or lunch. The main church was completed in the 1960's, although the brotherhood reaches as far back as the 15th century. The outside is of Sevillian Baroque style, while the inside is more austere, with the main hall built to mirror the Pantheon de Agripa in Rome. One of Seville's most famous churches, it was constructed in 1949 in what is referred to as an Andalusian Baroque style. Within the church the history reaches back several centuries when it comes to the principal "imagenes" of Jesus and the Virgin Mary, and the brotherhood (founded in the 16th century). One of Seville's oldest gothic-mudejar churches, dating back as far as the 13th century, it was once a mosque. The church has had a difficult history, with damages from two earthquakes (1356 and 1755) as well as two fires (1864 and 1936). While work needs to be done outside, I like walking around this church to see the back. Located on calle Bustos Tavera in the Santa Catalina neighborhood, the patio just behind the main doors has to be my favorite in all of Seville. During Semana Santa, the procession known as "La Mortaja", is one of silence and the ringing of the bell gives me escalofrios. Located in the Puerta de Jerez, this small chapel marks the entry to Avenida de la Constitución and is the last remnant standing of the former university site. The 16th century church has since benefited from Seville's re urbanization and has a more prominent position in the pedestrian plaza. For now you'll have to be content with a few pf my photos from the outside, as I am still planning to visit the Museum one day soon. The convento is located in the San Julian neighborhood, just a few blocks from the Iglesia San Marco. Also with photos from just the outside, the convent is located in an area with several other churches and convents. The plaza in front of the main entrance is one of my favorites when things are cleaned up. Located in Plaza Santa Maria la Blanca the church was formerly a synagogue in the juderia, or old Jewish quarter of the city. The outside has been restored but the inside is still in need of renovations. Works by Murillo can be found inside. The 18th century chapel is located between calles Sierpes and Tetuan, in the middle of the shopping district in Seville. The detail inside is wonderful, although I remember the church for the cultural association above it, which hosted a semi-illegal bar on the roof with wonderful views of the Cathedral. (It has been closed for many years). Between Plaza Santa Maria la Blanca and Plaza Alfalfa you will find Iglesia San Nicolas which dates to the 16th century. Inside there are plenty of interesting wood carvings and a large number of red marble columns. Located on Calle Aguilas just down the street from the Casa de Pilatos. I will soon have a few photos of the outside as well, although the inside is likely more interesting. Our first real Semana Santa with Nicolas, our son! A little of everything, with processions from our balconies, to rain, to Nicolas' first Easter basket. Unfortunate circumstances had me traveling during most of Semana Santa in 2011. We got some photos of a few processions which passed by our new apartment near the Plaza Alfalfa. For 2010 we're back on the ground now that the office is no longer on the procession route. Some photos of a paso being moved before the processions, as well as of my nephew as a monoguillo. The last year with our office window on calle Sierpes. This year less photos than 2008, but we managed some good shots of the processions from above. In 2008 again I took too many photos. But we were lucky with the office window overlooking calle Sierpes and the official procession route. So there are a lot of good photos of the floats from up close! A good mix of day and night photos from 2007. We made it out for several processions during La Madrugá, including the salida for the Macarena, which is always very crowded! This is one of the largest Semana Santa albums - too many things and I took too many photos! You'll find them from every day of Holy Week with plenty of details! From 2005 a collection of photos of the festivities. With my new zoom lens I was able to get more details of the pasos. Also with two years experience I was able to get closer to many as well! FIghting the crowds from midnight to 8am I had less energy to take photos, plus it was dark! Still, I managed to get some good shots around the Cathedral as well as our breakfast of chocolate y churros. This was the largest photo album of the bunch with maybe 100 photos. Also compliments the 2003 album as the rainy days were almost the opposite of in 2004. Seville photos wouldn't be complete without Semana Santa. Semana Santa starts well before the actual date. There's a lot to do whether you participate, work for the city or are simply a spectator. Get a small glimpse into some of the work before the event that takes over the center of the city for a week. Our first trip to the Feria with Nicolas! See some photos from the Ferris wheel as well as an advertisement for a pizza in the form of the Betis team crest (which has nothing to do with the Feria, but it's cool). We made it for two nights and a day. One night as invited guests to a caseta, then back with the kids for a day of rides and a night with more buñuelos and chocolate. You'll only get a few photos form this year - the main gate for the Feria, a few from a bar. We just didn't make it to see much! We missed the 2007 installment but made it back for 2008. This year a few days at the Feria with time for rides, games, an expensive dinner at the Feria as well as finishing the night off with buñuelos and chocolate. Only a few photos from the year 2006 from our visit one night. Enough for a short trip to the calle de infierno for a few rides and some chocolate con churros to finish the night. Some nighttime action from my trip during the first night, or alumbrao. We were able to sneak into a few private tents, plus make a trip down the Calle de Infierno! A few pictures from the day time activity including horses and some sevillanas. These photos come courtesy of Sean! Again thanks to Dave Barlag, who made it to the Feria in 2003, you can get a glimpse of some of the daytime action. In late June the balconies are decorated and altars erected throughout the center of the city. Plaza San Francisco, next to the Ayuntamiento is decorated and everyone celebrates Corpus. Practicing for a future role in Semana Santa, the younger generation decorates floats or pasos and marches around the street in what I like to think of as "Semana Santa Junior". Every year in Colegio Italica (local school) they organize a brief Cruz de mayo as a class project. The procession lasts about 5 minutes and is more chaos than anything else - what you'd expect from kids this age! PA year before we moved from our old apartment in Calle Gerona some kids put together a nice cruz de mayo with the help of their parents, friends and family. We made it the San Andrés church for a beer in Bar Santa Marta. Ok, I confess I didn't go - those crowds trying to touch the Virgen are just a little too crazy for me. But I captured a few images of the pilgrimage as it made it's way through Sevilla towards the final destination. From family in Umbrete who used their own camera. You can tell the photos are not as high resolution, but there is something about them which makes it look they came from the 1950's. Or maybe that's the way some people were dressed! Running through the month of October the Festival de las Naciones in the Prado de San Sebastian gives you a chance to sample food , shop and watch dance, music and other performances from around the world. This market HAD more dogs, cats, parrots and parakeets than anything else. But also fish (the kind you take home in a bowl, not the kind you eat), lizards, rabbits, gerbils, chinchillas and a few other strange animals. You can also pick up bird cages and lots of other pet care supplies. This market moved to Torneo along the river but I have not been so cannot confirm if it is still operating (June 2012). Here you will find mainly stamps and coins, but other items such as pins, semi-precious stones, antique watches, military medals and even phone cards (yes, they collect those, too!). You can also enjoy the surroundings in the Plaza, which is a site to see even when the market isn't there. Sundays until 2pm. El Jueves on Calle Feria is the oldest market in Sevilla, dating back centuries. You'll find everything from furniture to antiques, old electronics, paintings, posters and a LOT of other stuff. Thursdays until 2:30pm. Down the street from El Corte Inglés in the center and next to the Museum of Bellas Artes you can find paintings and sketches as well as a few other pieces from local artists. They range in styles and scenes, from your typical Sevillano patio realistically brought to life to an abstract of who knows what. Sundays until 2pm. Head to Triana, just across the bridge, take a right after the market and you'll find a lot of ceramics stores to choose from. While out with some family looking for gifts I snapped a few photos inside the stores. 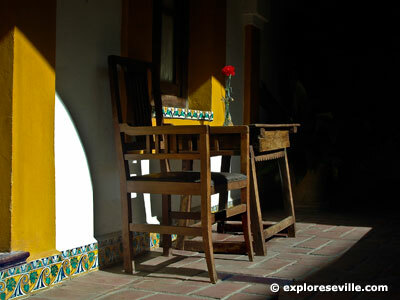 The typical Andalusian patio can be found almost everywhere in Seville. On the weekend's you often get a chance to peer through the gates of the older houses and get a good view. This photo album will continue to grow as I see more of them on my weekend walks. Remember, this is a section of "different" photo albums. Some of the many "faces" of the sidewalks you'll cover while here, many have been plucked from Plaza Salvador, and a few from Cádiz, Córdoba and Carmona. I don't know what else to call it - you'll see doors, windows and other bits around which look like they took a long time to make. Rather than a plain jail-cell looking set of bars these make a statement. This is a start and the album will continue to grow. Some graffiti plus other strange things I had to take photos of while in Seville or traveling around Andalucia. Take a look at Sevilla in the late 19th and early 20th centuries - a lot is still standing but some buildings and sites have changed. Dedicated to the world's best beer. I know many with other tastes may laugh, but I am 100% serious! I didn't intend to make a photo album of this but was there with a camera one day, so what the hell. You can see the inside of Plaza del Duque location. My first photo album on the site, with a general mix of tourist plus every day scenes including my neighborhood. My second photo album on the site with more scenes from my neighborhood, Santa Catalina, including a walk down my street. One of the two first division teams in Seville, Real Betis Balompie is the team to see here (I'm a betico, so I am biased). Wearing the green and white colors of Andalucia, the team was just outside of an invitation to Champions the year of this album..
Betis to La Copa del Rey Finals! After 120 minutes of a lot of action and no score, Betis won over Athletic Bilbao in Bilbao thanks to Doblas stopping two penalties. This album is the aftermath in Plaza Nueva, when beticos from all over the city converged in the center for a celebration! Betis 1 - Sevilla 0! A few images from the May 2005 match up where Betis beat up on cross town rival Sevilla. This was part of the nightmare week for sevillistas, as they lost to Betis and then watched us advance to the finals of the Copa del Rey. The UEFA championship game was played in Seville this year between Celtic and Oporto. While Oporto won the game, the Celtic fans were everyone's favorite here.